Issue: Below Ground is a collaborative artist book, created by my students and I in a new class I designed and taught at the University of Minnesota during Fall 2007 called Issue: Image and Text. We used the structure of the course to develop a group artist publication, which is printed as a four-color, paperback, perfect-bound, 80-page, offset-printed book. The theme for this first issue is “Below Ground” and investigates all things subterranean from the national registry of time capsules, to underground dwellings of hibernating animals, to basements overrun by family storage, to the nuclear waste dump site at Yucca Mountain. It includes 16 artist projects plus an essay. Contributors include Michael Blomberg, Dawn Doyle, Lindsay Doyle, Katinka Galanos, Sam Hoolihan, Caroline Houdek, Patrick Kinne, Christine Lenzen, Lynda Mortensen Pavek, Katharine Plowman, Rebecca Podmers, Chad Rutter, Andrew Schroeder, Molly Slovnik, Allison Snopek, Sara Simrall Wanless, and Jan Estep. The book was supported by the Department of Art, University of Minnesota; a UMN Coca-Cola Academic Initiative Grant; and a McKnight Foundation Fellowship for Visual Artists. Issue: Below Ground is the first volume in the four-part “Issue” series. Each offset-printed book explores a chosen theme from a variety of artistic perspectives. Volume four, Issue: Seen/Unseen, was created with students through the UMN course taught in Fall 2014. Volume three, Issue: Erasure was created through the UMN course in Spring 2012. Volume two, Issue: Land (Fall 2010) was produced outside the formal course framework and includes an international mix of artists. 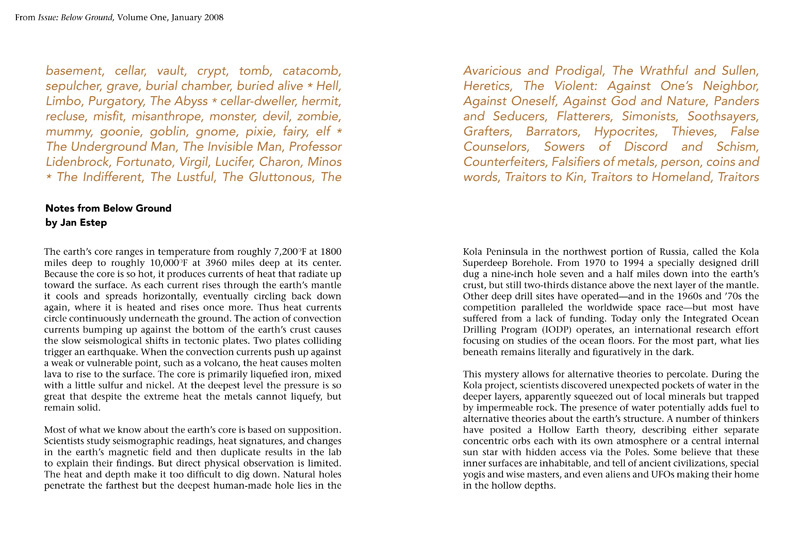 “Notes from Below Ground, ” an essay and word list, shown below, is my contribution to Issue: Below Ground. What do troglobites, the earth’s core, the submerged topography of Antarctica, and Plato’s cave reveal? An underground perspective on the knowable world.